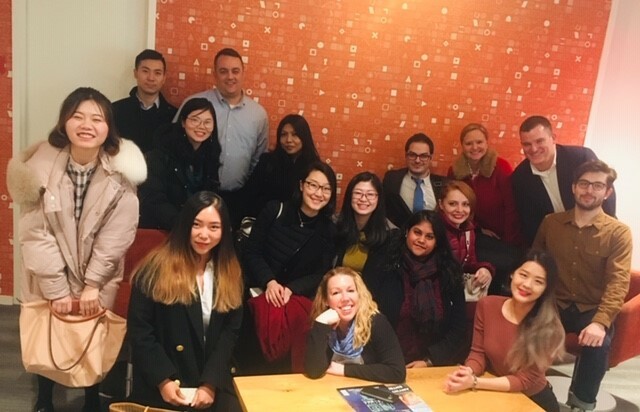 The health and wellness agency Saatchi & Saatchi Wellness (SSW) hosted Baruch graduate students for a site visit at their office in the New York City on Friday, February 22, 2019. The visit was organized by the Zicklin Graduate Career Management Center (GCMC). The Data Analytics Team of SSW prepared an informative presentation called “Exploring a Career in Marketing Analytics & Data Science” for Baruch students during the visit. The event started with an introduction of the team and the company background from SVP - Kevin Troyanos. 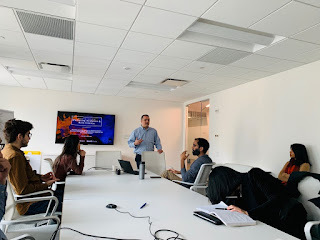 Mr. Troyanos shared the culture of the firm, an overview of the healthcare market, and underscored the essential role of data analytics in the industry. During the presentation, Troyanos asked everyone in the room to open the SSW website on their phone and showed us real time traffic analysis on their website in Google Analytics. We observed a general background analysis of visitors according to age, gender and industry. Based on that data, Mr. Troyanos expounded the collection and manipulation of data in order to assist their clients in decision-making. Later on, he elaborated the topics of business intelligence and data visualization and their application in SSW in greater detail. Allegra Mira - the Group Director of the Analytics & Data Strategy, also shared her experience in data strategy and disciplines, and digital analytics. She defined her job as a combination of two parts - art and science. She compared data analytics to the translation between different languages. From the data engineer side, the Group Director of Analytics & Data Engineer, Andrew Ghosh, briefly walked us through his experience while working as a data scientist at SSW. He also gave some valuable advice to students who want to develop a career path as a data scientist. A few members of the team also shared their experiences at SSW. Craig Moran, the Director of Analytics and Data Strategy shared his professional experience in leading the team and making the data-driven decisions. Mackenzie Gray, the Senior Analytics Associate of Data Science, who started as a summer intern at SSW in 2018, presented a brilliant data analytics project about doctor referrals he did during the internship. At the same time, team members were actively answering questions from students, including the differences between software, handling big data, and ethical issues of algorithms. The visit to SSW was a great opportunity for students wanting to pursue a career in data analytics and to learn more about working at a marketing agency. Saatchi & Saatchi Wellness is currently seeking interns for summer 2019. Check out their website, https://sswanalytics.com, for qualifications and additional details. Throughout New York City, Zicklin graduate students are busy interning at various companies every day. Each of them experiences new things throughout their internships, which is how they learn and grow. This spring semester, GCMC Office Assistant and undergraduate student Rudaiba Islam (BBA Finance ’21) is interviewing six Zicklin graduate students to share their journeys from class to work. At the end of this series, she will discuss from her own perspective what she learned from hearing from these students. Which courses did you take that helped you in your internship? I took a lot of Finance courses, but among them Corporate Finance, Econometrics and Investment Analysis helped me a lot to gain prior knowledge for my internship. These classes gave me a better understanding of financial tools and concepts that helped me develop better analysis skills. For example, learning about exposures, evaluating risk, equities, fixed income instruments, risk analytics and regression models. In addition, learning about attribution and regression in statistics helped prepare me for my internship. However, you cannot expect to learn everything in school. On the job, you’ll learn a lot of new skills. That’s how the process goes. What do you do in your internship? I work at a portfolio intelligence platform. We analyze data for institutional clients, and help them understand their investment portfolio better. This allows our clients to make smarter investment decisions. How is the environment in your internship? It is very easygoing and natural. Connecting to other employees or peers came naturally. What would have made your journey from class to internship a better experience? If I learned more about portfolio management at school, that would have been helpful. I learned the basics of Portfolio Management in my Corporate Finance class, but it would be helpful if we had a separate class focused on portfolio management. Other than that, the journey from class to internship was pretty good. Although, for international students, it’s always one step harder. Finding an internship is always a challenge, especially finding a good internship. However, if you keep up the work eventually you’ll land something good. If you were to give advice to a student, what would it be? Know what classes you need to take, and network more. In fall 2018, I had the opportunity to work as an Accounting Assistant Intern at an apparel company. Although I was doing basic accounting work, the experience taught me a lot. From this job, I learned how an entire company operates and the skills needed to be an accountant. At first, I recorded different invoices from vendors and customers, and used Excel to analyze the company’s financial operations. As an intern, I was treated just like full-time associates, and got assigned actual and meaningful tasks that were crucial and beneficial to the company. Being in the financial department, I handled a lot of accounts which demanded skill sets not taught in the general accounting curriculum in school. Hence, this was challenging at times when I was faced with a new account which I had not seen before. However, colleagues were always ready and willing to give their advice and guidance to help me overcome these challenges. Secondly, I gained deeper insight into the accounting industry, which has helped me significantly with my career planning. I developed a better understanding of the career path of an accountant through the internship, helping me to make better informed career decisions. Now, I am studying for the CPA exam and will try my best to pass all four exams. When I finish this internship, I will focus on my exams and apply to big four firms. In my future, I want to be a financial accountant. After a few years, with much work experience, I can possibly launch my own company. With the temperature in New York City hovering around bitterly cold in January, I love nothing more than to curl up with a good book over the weekend. Most recently, I've been reading "Becoming" by Michelle Obama, a Christmas present from my sister and brother-in-law. Besides being a fascinating read about someone I truly admire, I loved her honest account about how she dealt with the difficult task of wanting to change careers. Here are three lessons from her story that are applicable to anyone considering making a career change. After attending Princeton, she worked as a corporate lawyer, but struggled with staying in that career for the long haul. She writes, "I didn't want people remembering me for the stacks of legal briefs I'd written or the corporate trademarks I'd helped defend. I felt certain that I had something more to offer the world. It was time to make a move." Only you know what career is right for you. Trust your gut when it’s time to make a change. Unsure of what to do next, she decides to have as many conversations as she can with people all over Chicago. She writes, "Over the course of the spring and summer of 1991, I put myself in front of anyone I thought might be able to give me advice. The point was less to find a new job than to widen my understanding of what was possible and how others had gone about it." This is probably one of the most crucial pieces of job search advice: schedule conversations with as many people as you can and always approach it with the intent to learn. Michelle Obama schedules a meeting with Art Sussman, then legal counsel at the University of Chicago. Art then suggests she speak with Susan Sher. Susan Sher then connects her to Valerie Jarrett, then chief of staff to the mayor of Chicago. After an hour and a half conversation (originally scheduled for 20 minutes) Valerie offers her a job at city hall which she eventually accepts. She could have never predicted that meeting Art Sussman would lead her to a job offer. However, because she took action and made that initial conversation happen, it eventually led to a job offer. Be open to meeting people. You never know who they might know. Are you reading "Becoming" too? What are some lessons you've learned? Comment below. This is Part 2 of a two-part post. Every day, there are numerous Zicklin grad students interning in various companies throughout New York City. Each of them have different experiences, learn new skills and come away with new ideas and goals from the work they do. We asked each of them the same four questions, but their answers were hardly the same. I am currently interning as the acquisition analyst at a real estate private equity fund. My day-to-day tasks involve a lot deal sourcing, site inspection, dual diligence, and new market research. Even though I was able to utilize a lot of lessons learned in class, there was so much to learn, especially when it comes to market insights and transaction management. It could be daunting at first. However, I also see it as an incredible opportunity to immerse myself and ask questions. Furthermore, I realized that I can learn so much faster and more comprehensively through conversations with my supervisors, who have vast experience in real estate, instead of spending a full day searching online and trying to find an answer. I would say the most important thing I learned at the internship was to reach out to people whenever you have a question. You never know how much you can get out of a conversation like that. How have you approached networking at your internship? Share any one specific example that has been impactful for you. I have to actively reached out to investment sales brokers and leasing brokers for active deals and market leasing information on a daily basis. I found it extremely helpful to build a network of my own and check in with them every once a while for new deals instead of just starting fresh for every search. It is also important to nourish these relationships by just doing simple favors like introducing them to other investors when certain deals do not fit our investment profile but might work for others. There was one time when our team had to do a market study of an up-and-coming market in the New Jersey waterfront. I happened to know a developer friend from years before that I kept in touch with and was involved in a couple projects in that market. I reached out and was able to get a big picture of the market that we are canvasing over just a cup of coffee. I believe one’s network will play an indispensable role to one’s career. What has been your biggest contribution to your team at your internship? Why? My team has been actively looking for reliable sponsors who have shown a good track record of development work in certain sub-markets within the Tri-State area. A friend of mine happened to be searching for a joint venture partner on behalf of the development team of her firm. I got together with her and managed to arrange a meeting for the partners on both sides to meet with each other. Even though we did not decide to proceed on the specific project they were fundraising for, we managed to form a capital partnership with them for future projects that may fit our investment profile better. I am very proud of the initiative I took by getting out there and exploring the potential of my existing network. After this experience, what would you like to learn next? I really enjoyed my current internship experience because of the amount of responsibility and the room for me to take initiative. I am definitely looking to step onto a bigger platform with higher deal flow and more established reputation. I would love to have a more well-rounded training program where I can track through the whole deal process in a more systematic way. I would also like to have a mentor who I can go for every question I have in terms of market insights as well as professional development. For students having a difficult time finding an internship, what is one piece of advice you would give them? I have two pieces of advice for students having difficulty finding an internship. The first one is to form your network and keep in contact with them. I got my internship through a faculty member and he has a list of internships that he shares with his students. Even though I have never taken his class, I was given access to the list and was able to get his referral for one of the positions, which helped my interview and application significantly. I would advise every student to reach out to all of their existing network for referral or even just advice. I would also encourage everyone to get out there and attend more academic conferences and networking sessions to form new relationships and add to your network. You never know how people you know can help you along your career development. And of course, do not forget to give back and think of others when you see good opportunities for them. What has been one of the most important things you’ve learned at your internship? I am very new to the field of debt capital markets. One of the most important things I’ve learned so far at work is about the function of my team within banking, a complex and highly specialized world. It sits with the coverage group, where bankers are fully dedicated to their individual clients, responsible for and closely following both equity, debt and structure changes. In capital markets, however, we are also required to have a good sense of market movement, on top of the performance of individual clients. In that way, it is more macro than micro. I didn’t benefit directly from networking, such as getting a referral. Networking, however, does open my mind and gives me direction. I talked to two non-Chinese international students who also have sponsorship needs and asked about their approach on this. Both shared how their job application process involved relentless effort. I compared myself to them, and realized that maybe the reason that I have not been receiving any feedback was due to the low number of applications, and perhaps timing. I started to receive interviews following their suggestions to increase the number of applications later in the summer. I am still unsure if I contribute enough to the team. At the moment, a lot of work is assigned to help the pitch book and data preparation. My lack of knowledge in fixed income seems to prevent me from stepping up and taking on more responsibility. As mentioned above, I need to build my knowledge in debt capital markets, which involves corporate finance and macroeconomics and how these two talk to each other. It is probably important to speak to as many as people from companies and to understand the nature of their work from within. In finance, a lot of functions are specialized. Unless you have actually done the work required in the job, you have a very vague understanding of what it is. The most important thing I have learned during my internship is that I need to keep communicating. I'm doing a very analytical job and I used to believe that sending out my analyses was all of my job. But during my internship, I realized that if I want to convey my ideas, I have to even spend more time talking with colleagues than actually doing the analysis. Networking can be done everywhere. The most impactful networking I have done during my internship was actually in a coffee break. We started from our vacation plan and my school courses and ended up with a job opportunity in quantitative finance. I helped the team build an automatic reporting tool that can generate a daily report by clicking one button. It is now used on the team among different locations. I used Python and SQL, which I learned at Baruch to generate the report. I would like to focus more on data scenic and try to bring the latest AI technology into risk management. Everyone is talking about AI these days, and it indeed has great potential. From data mining to natural language processing, these functions can be used in investment banking to improve efficiency and accuracy. For example, counterparty reports are currently done by an analyst following the same template. Natural language processing can automate the process so that clients can get a report faster and more accurately. Keep improving the skills that your dream position needs and never give up! When I just started job hunting, I had no idea what employers wanted. Then I looked at lots of job descriptions and summarized the most frequently noted skills and tried to learn them. When I put those skills into my resume, my response rate increased a lot. Developing an expertise and becoming a subject matter expert. I figured out that one way to build trust quickly is to show you really understand a subject, and people can rely on you to do a lot of work. With an enjoyable working relationship, it’s much easier to build relationship outside of work. People are also more willing to support you if they acknowledge your expertise. I was very active in attending all kinds of networking and recruiting events while I was looking for internships. I think one important step students can do to increase their chances of getting an internship is meeting people and building relationships with as many professionals as they can. It is important to also be generous in your network so people not only know who you are, but like you as a person and will be willing to offer an opportunity. I was very diligent in a case competition and constantly followed up with a senior person who was a mentor for students participating in the program. From that, I was put on a referral list and ended up with a full time job with the firm. I think my biggest contribution is that I already took the lead and guided other new team members while only been at the team for six months. I joined this new team where we model liquidity under different scenarios and set our liquidity binding constraints. I put in a lot of effort, and was able to participate in many strategical analyses including Brexit analysis and Funding IHC analysis. I was able to guide the members that later joined the team and have played an important role in the team. I hope to develop an expertise in the secured funding space, and understand different liquidity drivers, which will position me very well for analytical and strategy roles within bank resource management and a securities lending role. I also hope to continue polishing presentation skills to deliver concise and effective communication. Do not lose hope and continue trying. I received so many rejection letters before my offer letters. The only thing I did right and will continue doing is to be persistent and keep trying. Opportunities are always out there. If you missed this one, then catch the next one. From my internship experience, I think that taking criticism is an important thing in your career. Don't believe everything and have your own perspective. It can be difficult to be told that you need to improve upon something or that you completed a task incorrectly. As an intern, I learned how to handle criticism with grace (both from watching coworkers receive criticism and from receiving criticism myself), which also built my confidence in a professional setting. Since I already had a trial run in the workplace as an intern, I know now that I can handle criticism maturely, and I know how to respond to it professionally and respectfully, which will definitely help me in my career. I found my internship through a referral. In the business world, networking is the most important thing. Whenever there is a networking event, just go and talk with someone if you are free. Build as many connections as you can and follow up. For myself, as a president of a club, I play a big role in reaching out to professionals to come to club events. Take this internship as an example, our club held a networking event last semester. I talked with the manager from this company during that event. After the event, I sent a thank you letter to him and invited him to a coffee chat to get more insight into his role. Also, I invited him to join our club's upcoming events. After these events, a connection was built and he knew more about me. When there was an opening in his company, he contacted me to see if I was available for the position. I was reviewing the company’s bills and discovered that we were greatly overpaying for electricity and water. I recommended to my boss that we install energy efficient light bulbs throughout the office and install low flow toilets in all the bathrooms. She approved the idea and was very impressed with my initiative. In the time since, the company’s electric bills have decreased an average of $200 a month, and our water bills have decreased an average of $250 a month. My advice is to attend as many networking events as you can. More than 80% students get their jobs through networking. The importance of networking shouldn't be discounted when you are in the midst of a job search. In fact, networking should become a part of your daily work and career-related endeavors. Your career network should be in place for when you need it, both for job searching and for moving along the career ladder. Since you never know when you might need it, it makes sense to have an active career network, even if you don't need it today. Networking, or "professional" networking, involves using personal, professional, academic and familial contacts to assist with a job search, achieve career goals, or learn more about your field, or another field you'd like to work in. Networking can be a good way to hear about job opportunities or get an "in" at the company where you'd like to work.